On the night of February 26, 2012, 17-year-old Trayvon Martin was shot and killed in a Florida neighborhood while on his way home from a convenience store. The killing opened emotional debates about racial profiling and self-defense laws. 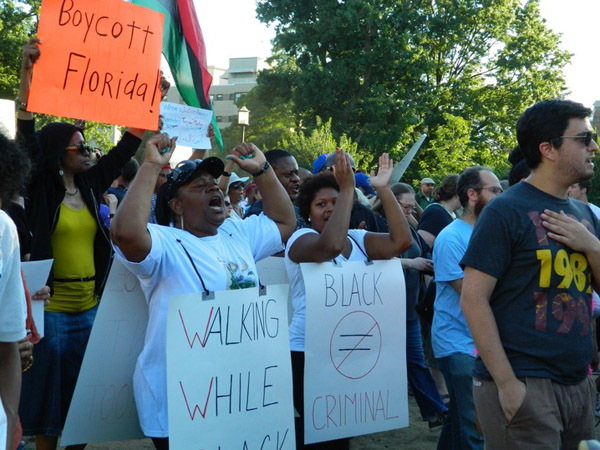 Watch Americans Rally in Protest of Zimmerman Verdict on PBS. See more from PBS NewsHour. The man who killed Trayvon Martin was 28-year-old George Zimmerman, a neighborhood watch volunteer who decided to follow Martin as the teenager walked back from a trip to a convenience store. There was a scuffle that ended when Zimmerman shot Martin in chest. Zimmerman claimed protection under the Florida’s Stand Your Ground Law, which gives people the liberty to use deadly force if they believe their lives are in danger. For nearly three weeks the jurors listened to testimony about what happened the night Martin was killed, trying to make sense of the struggle, and who was the aggressor. Martin was unarmed, but the defense claimed that he used the concrete sidewalk as a “weapon” against Zimmerman. With only one eyewitness, Zimmerman, and a lack of evidence, a jury made up of six women found Zimmerman not guilty of second-degree murder and he was acquitted of all charges on July 13, 2013. On the night of the confrontation, Zimmerman told 911 dispatchers that a “real suspicious guy” looked like he was “up to no good.” The police dispatcher told Zimmerman not to pursue Martin, but Zimmerman decided to act. Following the verdict announcement, people took to the streets and social media to voice their reactions. Hundreds of protesters in Los Angeles closed down 10 Freeway chanting “Justice for Trayvon,” and thirteen people were arrested on the third night of protests. Police in Atlanta said more than 2,000 demonstrators gathered outside of the CNN Headquarters. In Washington, D.C., peaceful protests started around midnight Saturday and continued Sunday morning and in New York City, hundreds of protesters marched into Times Square. Meanwhile the Twitterverse was up in arms with people from all over the country expressing their views in tweets and hashtags. Celebrities also participated, with Solange Knowles tweeting a picture from a rally for Trayvon while her sister Beyonce held a moment of silence in honor of Martin during her Mrs. Carter World Tour concert in Nashville Saturday evening. More than 460,000 people have signed a MoveOn.org online petition by the NAACP, urging the Justice Department to open a civil rights case against Zimmerman. The Martin family also has the option to pursue a civil case against Zimmerman, though they have not said whether they are planning to do so. How are you talking about the Trayvon Martin case in your classroom — or at your dinner table? Now we’re following up with a guest post by Anthony Turner, a 19-year-old senior at Brooklyn Community Arts and Media High School. Mr. Turner is a writer for Youth Communication, a New York City organization that publishes true stories by teenagers to “help marginalized youth develop their full potential through reading and writing.” I reached out to the organization, one I’ve admired since I was a classroom teacher myself and read its publications with my students, to ask if any of its writers would like to submit a guest post. You might invite your students to post comments on Mr. Turner’s essay, below. We’ve also listed some related resources from The Times and The Learning Network, along with a few key questions they raise on race and stereotyping, gun laws, activism and the role of young black men in our society. Please tell us how you’re addressing this news with the young people you know. You would never think a walk to the store would get you killed, right? Well, that was what happened to 17-year-old Trayvon Martin. As he was coming back home from the store carting an iced tea and Skittles, a neighborhood watch volunteer named George Zimmerman felt “intimidated” by the young man and shot him, killing him. This brings up a lot of questions: When does an innocent high school student become “intimidating,” “threatening” or “suspicious”? How intimidating can someone be with a few munchies in their hand, just walking down the street? If you’re a black kid with a hoodie, is it immediately assumed that you’re “bad” or a “troublemaker”? Would things have been different if Martin was a white kid strolling down the street or if he had been dressed differently? As a young black male myself, I sometimes get the sense that other people judge me on my appearance. The fact that I’m a black kid in a hoodie is a mark against me (even though I don’t do anything “suspicious” at all). At times I feel self-conscious, wondering if people on the subway or street automatically wonder: “Is he a troublemaker? Should I hold onto my phone tighter?” It makes me feel bad to think that these kinds of thoughts surface in people’s heads when they see a black person. Part of the problem is that the media — including some black celebrities — depict black males as dangerous. In many music videos we’re the same people who talk about shooting, stealing people’s money and being tough in the ‘hood. That has an influence on both young men of color and on perceptions of us. In my neighborhood a lot of guys sag their pants, wear hoodies and walk with a distinct swagger and cold glares. However, there is a big difference between copying a “tough” look and actually being a real threat. That is one reason Florida’s “Stand Your Ground” law, which justifies bodily harm or death if the person feels intimidated or threatened, is so flawed: anyone can feel threatened if they are scared or paranoid about their safety. And it seems that Zimmerman was paranoid. A recent New York Times article said that Zimmerman “had placed 46 calls to 911 in 14 months, for reports including open windows and suspicious people.” But simply “looking suspicious” in someone’s eyes shouldn’t give that person the right to put his hands on you. Or shoot you in the chest. Respond to Mr. Turner’s essay by posting a comment here. The following questions are suggested by the related Times articles and Opinion pieces that are linked above them. From “In the Eye of a Firestorm,” an in-depth article on the case and the questions it raises published on April 1. There is also related multimedia that includes video, the police report, an interactive map and more. What are the known facts in this case? What does George Zimmerman say happened? What do the 911 tapes show? What do witnesses say? What is not known? What questions have been raised about the events? What is the “black male code”? Are you familiar with it, or something like it? Do you think that, because of stereotyping, black men and boys have to “go above and beyond” to show strangers that they are not threatening? Is this father “doing what any responsible parent would do: teaching my son how to protect himself,” or do you think, as he says his white friends might, that he is unnecessarily teaching his son to be paranoid? Why are young black men disproportionately singled out for discipline in school and more likely to be stopped and frisked by New York City police officers? What can be done to address these imbalances? What is the “Stand Your Ground” law and how does it apply in this case? What have been the consequences of the law in Florida since it was passed in 2005? Does self-defense legislation like Stand Your Ground laws provide too much criminal immunity when innocent people are shot by someone who feels threatened? Or are these laws still needed to allow people to protect themselves? What makes a crime a “hate crime”? Do hate crime laws protect against intimidation and bigotry, or are they unnecessary and unfair? Is digital activism — that is, posting about causes to social networks — real activism, or just “slacktivism”? Can it make the world a better place? How does this case highlight the complex ways that news does and does not travel in the Internet age? Does the case attest to the need for diversity in newsrooms? 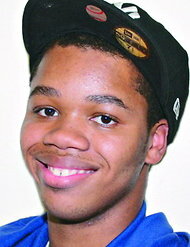 Anthony Turner’s essay is reprinted with permission from Youth Communication.